Ahoy there me hearties! Here’s yer favorite app pirate back from another adventure with the crew from the seven seas. We’re on a quick break so this bucko is taking the time to update ye with another app review. The app that I will share with ye for today reminds of the days when me wanted to become a boxer. Aye! Aside from becoming a pirate, this old salt also dreamed of becoming a star in the ring and knocking down opponents when I was a little lad. The title of the app that we will review is Boxing Star by FourThirtyThree Inc.
Boxing star deserves 5 stars when it comes to the graphics department. There are various characters in the game that look different from each other and have their own style. Customizing your main character is also possible. The characters may not be realistic; especially they look more of like a 3D caricature because of their big head, but their muscles and their expressions are all on point. You would definitely feel like you are looking at boxers. There are also different background settings in the game including the boxing ring itself, the streets, training gym, and the house of the main character. The animation of the game is flawless. The characters move fluidly. What’s even more impressive are the movements of the boxers when they fight against each other. You will see the force through the sound and motion effect of the game. There’s also a tutorial on how to control the character like how to throw punches so you’ll know what to do. It may take a bit of getting used to especially it requires various combination to get a better chance of winning, but you’ll get the hang of it after a few games. One good thing about this app is that it comes with two different game modes. You can switch from one mode to another to prevent getting bored from the mode that you are playing. 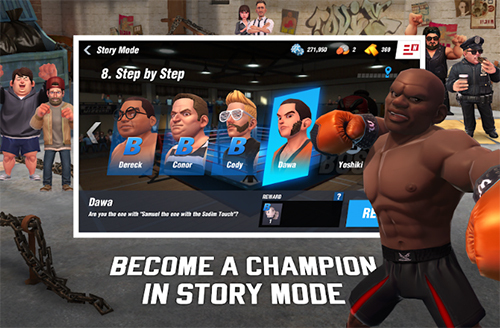 The story mode will follow your growth from being a street boxer to your professional boxing career in the ring. 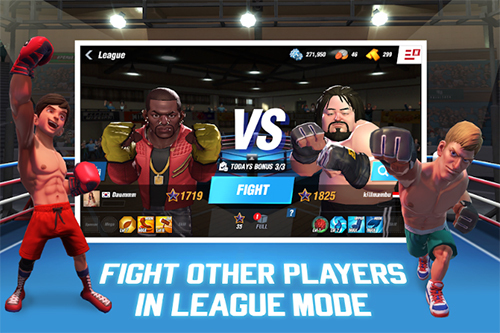 The league mode on the other hand will let you fight against other players. Since there are different player levels, you need to upgrade your skills and items in order to increase your level and get a better chance of winning stronger opponents. This app is free to download and play. However, it will be difficult to move forward the next stages without upgrading skills and items as your opponents will be hard to knock down. Upgrading will be hard to do since you will be faced with stronger players. It feels like being forced to make an in-app purchase to do the upgrades and continue with the next level. Boxing Star is free to download and play. It has a tutorial that will teach you how to fight against your opponent. The graphics are amazing and it’s customizable. There are also different background settings and game modes. It’s difficult to move forward the next levels because the opponents are stronger. You will not some upgrades, which may force you to make an in-app purchase. This game is fun to play, especially on the first few levels. However, it may be difficult to upgrade is faced with stronger opponents. If you are patient enough to keep on fighting, you can still make a progress without spending anything. This is a nice app to try for those who are into boxing games or sports apps in general.